Do you notice that your social media platforms were flooded with Taiwan travel photos during last December? I contributed to the spam too! Indeed, Taiwan is a nice place to visit! There is direct flight from Singapore to Taipei, which takes about 4++ hours. But we took a slightly longer route - we took Cathay Pacific airline with 1 hour of transit in Hong Kong. This was the cheaper alternative as compared to other full service flights, and the price was comparable to budget airlines during our dates of travel. Remember - plan but don't over-plan! (Read our other tips on Planning a Trip to Taiwan with Children). Our modes of transportation include train, metro, taxi and bus. Some of you asked how we settled our luggage as we moved from one place to the other. We deposited our big luggage at the hotel in Taipei (York Design Hotel) when we travelled out of Taipei, and brought along 2 backpacks to Yilan and Miaoli. Do check with the hotel before you make your booking, to check whether it can help you to keep your luggage while you travel to other places. Thanks to the free gifts that we redeemed from Taiwan Visitors Association - one-way bus vouchers between Taoyuan International Airport and Taipei, we took Kuo-Kuang Bus 1819 (國光客運) to Taipei Main Station without spending a single cent! The bus ride took about 1 hour. We sent our wishes to the sky at Shifen! It was a pity that we didn't manage to visit Shifen Waterfall due to the rain. It rained the whole day, but it didn't dampen our mood, because we had great fun at our homestay in Yilan - 自然捲北歐風格旅店! It was probably one of the most memorable accommodations that I have ever stayed! We didn't include Yilan in our itinerary initially. Fortunately we visited there eventually! There are so many interesting things to do in Yilan! A close touch to the nature! The children had fun feeding the animals in the farm! It was quite an eventful day! We picked strawberries at Dahu, saw many old trains under one roof, took high speed rail from Miaoli to Taipei, and had dinner at Rilakkuma cafe which took me 50 minutes to make an online reservation! The children enjoyed themselves very much "working" in BabyBoss, and then we had Taiwanese street food for dinner at Raohe Street Night Market. Taipei Main Station is not just a place to take Metro, train and high speed rail, it is also a place to shop for souvenirs! We took Kuo-Kuang Bus 1819 (國光客運) from Taipei Main Station to Taoyuan International Airport, and did last minute shopping of souvenirs for family and friends. We experienced 3 types of accommodations during our stay. York Design Hotel is located near Taipei Main Station, along Nanyang Street (which is also known as "tuition street", because there are many language learning centres and tuition centres). It is just a few minutes walk from Taipei Main Station. There are many eateries and a few convenient stores in the area, so you won't get hungry! There are also many places for shopping, including Uniqlo, Daiso as well as 光南大批發 which sells a lot of stationery, toiletries, CDs and other stuffs! The hotel itself occupies level 4 of an old building, if not for the flashing LED signboard, we may have missed the entrance! Don't be too upset when you see the old building, you will be surprised when the lift door opens at level 4! The modern-looking counter brings you to another world! The corridor looks so nice! We booked Nordic Warm Quad Room (北歐溫馨4人房), which does not have window, but we didn't really mind about it. As the name implies, the design of the room gives a feeling that we are in Northern Europe! Very cozy! The sockets in the room are international sockets, so travel adapter is not required. However, the bathroom was a bit too small. Anyway, it was still quite enjoyable to shower as the shower head was very good. Don't worry about drinking water, as there is water dispenser along the corridor. As our first night stay was in late November, they had a promotion - free breakfast just by joining as a friend of their Line circle. The cafe that they collaborated with is just across the street! As I mentioned, the location of this hotel is very convenient, we had different types of breakfast for the few days when we were there! Rice balls - the filling is very generous! There are pork floss, youtiao and vegetables! Egg omelette (蛋餅), 燒餅, youtiao and warm soya bean milk. Oh, yes, McDonald's! They have toast breakfast set! Our objective is to have experiential learning as a family. During the long train or bus rides, we looked at the beautiful scenery together, and talked about things that we saw - the windmills, the sea, the cars and so on. We appreciate the kindness of some Taiwanese people. We were thankful to the gentleman from strawberry farm who offered to give us a ride to the train station. When we were trying to figure out our way at a Metro station, a nice person offered help. During our taxi rides, most drivers were very warm and chatted with us, and along the way, they introduced the places of interest and nice food, even though we didn't ask them. Well, while many places are quite child-friendly, there are also places that are not. There is no pedestrian pavement in some places like Yilan, so we were very cautious as we walked along the road. We had to raise alert on the scooters too, as they came in all directions! Remember to bring notebooks to Taiwan! There are many places where you can stamp on the notebook with nice rubber stamps! If you ask me what to buy in Taiwan, I would say - snacks! Pork paper (豬肉紙), pineapple cakes (鳳梨酥), sun cakes (太陽餅), brown sugar (黑糖) and so on! Pork paper is very tasty! If you are fans of cute stationery, you can find interesting items from 光南大批發 or other stationery / gift shops. There are many more interesting places in Taiwan! We hope to go there again! Now that you mentioned it, yes! Almost everyone I know went to Taiwan, hahaha!!! If we get to visit, I want to try that pork paper... yummz! It seems that many Singaporeans were in Taiwan last December! Oo, my husband was just saying we should visit Taiwan. This itinerary and the links will come in helpful! Thanks for sharing! We travelled to 3 different parts of Taiwan, so it is only logical to stay in different places. Pork paper, how unique, I've not tried it before! I love those pretty washi tapes, where did you buy them from? You can find many pretty washi tapes at 光南大批發, located near Taipei Station. There are many other interesting home stay in Yilan! You have very nicely mentioned all the activities we can cover during the stay. I am so tempted to go there. Pork paper look so crispy. The pork paper is really delicious! Taiwan is very big, we hope to explore other parts next time! Thank you! Hope you find our travelogue useful! My Facebook gets flooded with Taiwan pictures throughout the year. But yeah, especially so during school holidays. I shall remember to buy paper pork the next time I'm there! Haha! Because many of us like to visit Taiwan! I've been following your Taiwan travelogue for a while now and this summary is perfect!! Can refer to it and then plan our itinerary.. hopefully we get to make a trip this year!!! Thank you! Hope your wish come true! Which month did you go to Taiwan? How was the weather during your visit? We went to Taiwan in the first week of December. The temperature was around 18 degrees Celsius. It was cooling when it was not raining, but was very cold when it was windy or when it was raining! 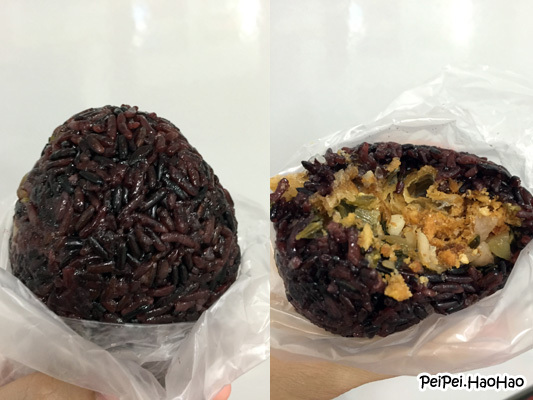 The dark rice balls pictures are great! Yes, try the rice balls, they are delicious! Hi, may I know most people will choose to go Flying Cow Range first, then Yilan, just curious any specific reason you go Yilan first? For CX flight, so by the time you land will be evening time? I am going with two kids and my parents, so thinking what is the best way to bring them around. thks! Hi, I think that it actually doesn't matter whether you head to Flying Cow Ranch first or Yilan first. For us, one reason for going to Yilan first is because of the availability of accommodation at Flying Cow Ranch, the cheaper one was not available on the earlier days when we reached Taiwan. For CX flight, we landed at Taiwan at about 6+pm, we took the bus to Taipei and reached the hotel at 8pm, and we had dinner near the hotel after we checked-in. I'm curious. When you mentioned taxi, did you hire the taxi everyday or u get a taxi at the location? We did not hire taxi everyday. We only got the taxi at the location.